I love strategy games that can either teach me something about history directly, or at least encourage me to learn something new about history. In that context, I love Numantia. Related reading: The very best strategy game on PlayStation 4 is Romance of the Three Kingdoms. Matt's review of the most recent one. My knowledge of ancient Rome and, more particularly, the bits of the empire that aren’t covered in just about every gladiator swords-and-sandals film, is woefully inadequate. Case in point; I didn’t know Numantia existed. I knew that what is now Spain (or, I guess more accurately now, Spain and Catalonia) was part of the Roman Empire, but I knew very little about the wars that got it there, what the place was like at the time, and who the heroes and villains of the region were in the inevitable wars fought over the land. So I started playing Numantia, which is in basic terms a very traditional turn-based strategy game set in and around the historical settlement of Numantia. It's a game that covers off the events that led to the historical downfall of the city. Within the first hour I was hitting up Wikipedia; not because I was bored of the game by any means, but rather that I was absolutely fascinated about what the game was telling me, and I was keen to find out more. So Numantia really was the central point around which a really real, very violent conflict was fought. It was notable for also being quite exotic and exciting in that it featured heroes both on the side of the Celtiberian (Carus of Segeda) and one of the most powerful Roman generals of the time (Scipio Aemilianus Africanus). 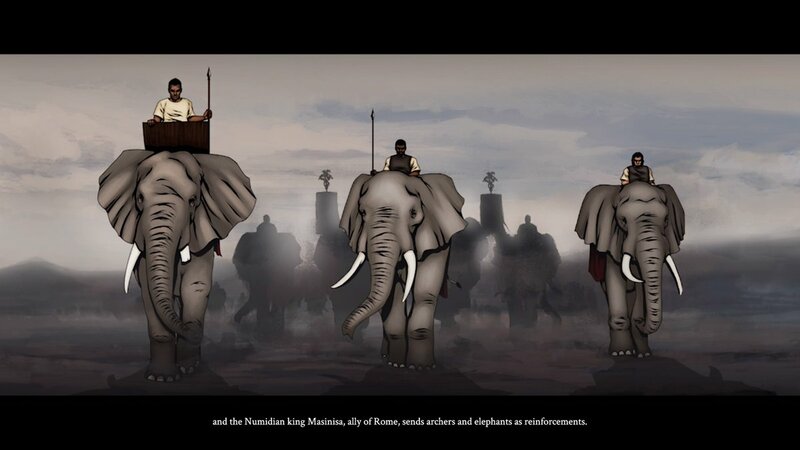 It was also notable for the Romans bringing in African troops - war elephants and all - and yet managing to lose a number of critical battles. As a result, there were a lot of stories to emerge from the conflict, which lasted the better part of 22-odd years, and I'm honestly surprised Hollywood hasn't blockbustered this one yet. Of course it ended badly for the Celtiberians, and eventually Numantia was besieged and, thirteen months later, after starving and resorting to cannibalism, the remaining people burned the city to the ground and died free, rather than become enslaved. No, that’s not a spoiler, it’s something that happened a couple of thousand years ago. These events, dramatic and prolonged as they were, gave us this rather clever strategy game that melds battlefield tactics with a lot of storytelling. Numantia wants to be The Banner Saga at times. The Banner Saga was instrumental in showing us how an independent developer could give players an intense narrative, driven by moral choice and consequence, and the bound it within a relatively standard strategy game context. Numantia wants to be that exact same game, replacing The Banner Saga's fantasy world with real history, and it almost pulls it off. Between battles you’ll regularly be presented with blocks of text that describe a particular scenario, and then have a couple of choices for how to respond. 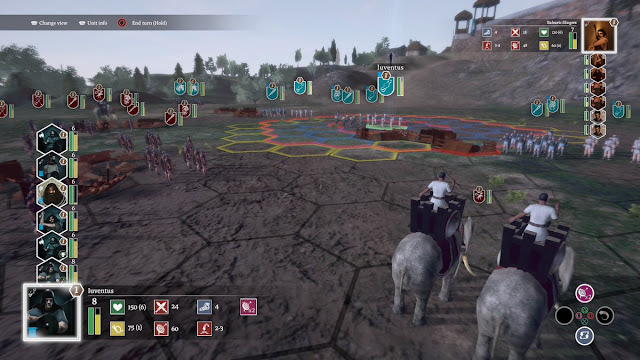 Do you attack the Roman scouting party that is dangerously close to your walls, but doesn’t seem to have an army backing it up? Do you try to make peace with the Romans in the first place? These decisions never have a “right” result so much as “the one with the consequences I can accept.” Which all sounds like the Banner Saga, right? The game even has the same downbeat sense of futile desperation to it… particularly if you’re playing the Celtiberian campaign. Ultimately the storytelling isn’t quite as strong, and that's because there isn’t the same sense of progress in Numentia as The Banner Saga. Part of the issue is that they do ultimately belong to different genres, and only one of the two is really a natural fit for in-depth, character driven storytelling. Combat in The Banner Saga has a very tactical RPG approach. There’s a sense of progression there as your characters develop and evolve from one battle to the next, and this tends to mean you get attached to some of them and, in turn, care about what happens to them. 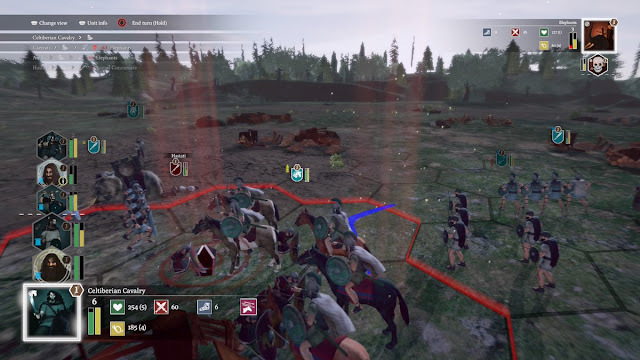 In Numantia, units don’t evolve from one battle to the next. They continue to take the field in the exact same numbers (the dead are automatically replenished after battle), and while you can upgrade them with equipment, they’ll just hold on to the same equipment from one battle to the next. There isn't the same sense of character development through their on-field exploits. That is, of course, what you want in a tabletop strategy game, in which an accurate recreation of the battlefield conditions is important, and is what Numantia ultimately aims to be. 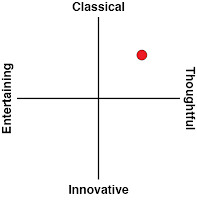 But it does weaken the narrative sentiment but effectively splitting the game into two distinct “blocks”, and then struggles to meaningfully link the two. 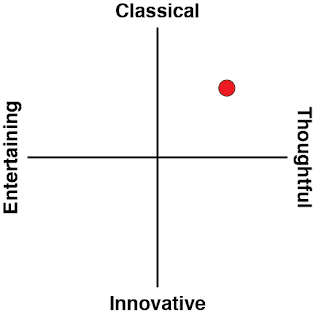 I also didn’t like that I had minimal control over how the narrative would play out. The decisions that you make in those narrative sequences have consequences, but they’re immediate, and the overarching narrative is far less bendable. I would have simply loved to be able to play a diplomatic game and completely change the course of history. Numantia had the storytelling foundations for that, but frustratingly fell short in delivering it. By contrast, decisions I'd make hours previous had a habit of coming up to bite me on the backside in The Banner Saga. The strategy action is really, really good though. You’ve got quite a lot of control over which units you “buy” and then put on the field, so you can run everything from a heavy cavalry force through to a ranged specialist army. Or if you're boring you could try and overwhelm the enemy through sheer numbers of infantry. The battle map is arranged in hexagons, as should be the case with any halfway serious wargame, and while there’s minimal mechanics at play around morale and supply (just make sure you keep your units close to leaders for fighting effectiveness), which are usually important to wargames, there are all kinds of flanking and strategic options at play that closely emulate the respective fighting styles of the two forces. 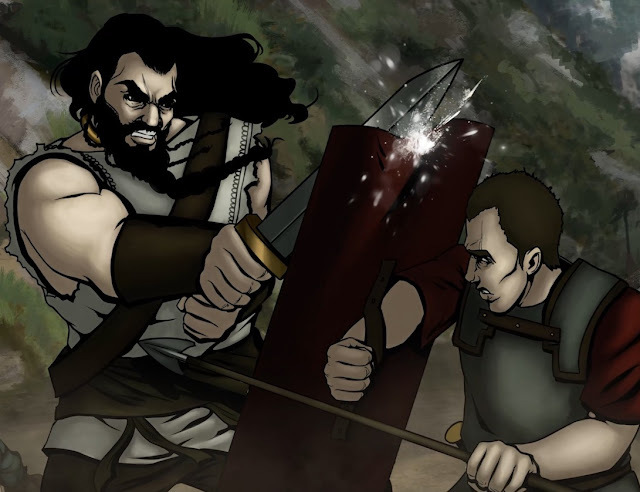 Though wars in ancient history are really difficult to balance, because for the most part the quality of the soldiers and equipment between Rome and its enemies weren’t even in the same ballpark, the developers of Numentia have done a great job in putting the Celtiberians, as complete fighting forces, on an even playing field with their Roman counterparts without losing the particular flavour of both fighting styles. The game also looks gorgeous, and really sets a scene with the hand painted aesthetic for cut scenes and the world map. In-battle, units look really nice zoomed in, though it can be a little difficult to visually make out the differences between units when zoomed out. What was disappointing was that as the battle wore on, fallen bodies would disappear off the screen after a turn or so. 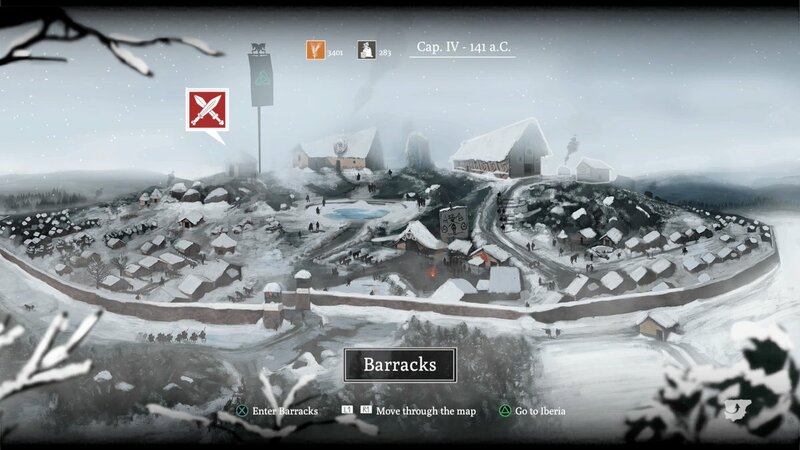 Gruesome as it is, war is incredibly bloody, and leaving the bodies on the map to show where the battling took place is an authentic touch that has been expected of the strategy genre since the very early days. I remember playing the old Field of Glory on the PC back in the DOS days, and even then the game left the bodies on the battlefield where they fell. Related reading: Another strategy game with a strong narrative focus is Thea: The Awakening. Matt's full review. As I overwhelmingly prefer to play games on my consoles where I can, that there are now a few strategy games on console makes me quite happy, as it's a favourite genre. Nobunaga’s Ambition and Romance of the Three Kingdoms, Grand Ages: Medieval, and now this one are all worthy and deeply enjoyable. It’s a good sign that these games all work so well, dispelling the myth that strategy games and consoles don’t mix. Numantia has really impressed me in the way that it has inspired me to learn more about the conflict it depicts, and it has done a really good job of accurately recreating the surprisingly varied range of battles, locations, and twists and turns that occurred through the war.